Qualcomm Phone Emmc Repair Tool is a small application for windows computer which allows you to repair the Emmc in Qualcomm Smartphone and Tablets. To use the tool, you need to boot your Qualcomm Device into the EDL mode, then connect it to the computer. 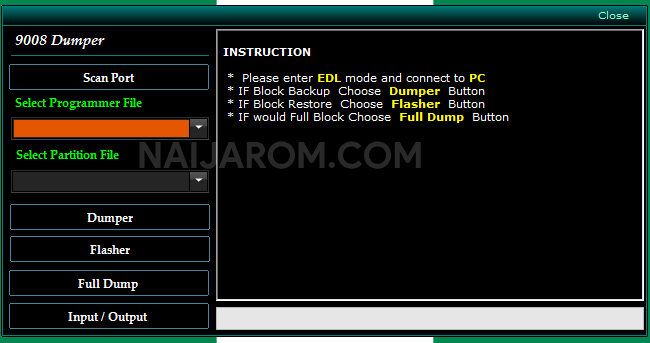 If you want to block backup then choose dumper option or if you want to block restore then choose flasher option. It supports various models including Huawei_MSM8x10.mbn, HuaweiMSM8916.mbn, HuaweiY625.mbn, OPPO3005.mbn, OPPOAl1.mbn, OPPOA33.mbn, OPPOA53.mbn, OPPOF1.mbn, OPPOMirror3.mbn, OPPOR7PLus.mbn, OPPOR8109R5.mbn, OPPOR83OS.mbn, VivoX5.mbn, Vion22L.mbn, Vion28L.mbn, MiMAX32.mbn, MiMaxPro.mbn, Redmi4x.mbn, MiNotePro.mbn, Redmi3.mbn. [*] Credits: Qualcomm Phone Emmc Repair Tool is created and distributed by DaHe. So, full credits goes to DaHe for sharing the tool for free.